Gnarly Charly, gymnastics expert and bike riding candidate for GCPNC, won a seat on the board! Volunteers from Figueroa For All and the LACBC’s RideFigueroa campaign helped “bike the vote” during recent neighborhood council elections – and we elected 85% of the candidates we identified as pro-bike lane! Victory! 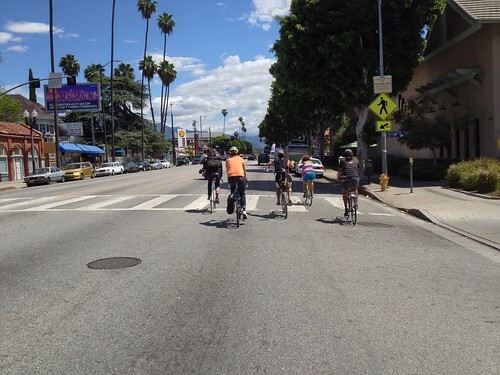 Will it be enough to convince Gil Cedillo to let the LADOT install bike lanes on North Figueroa? That remains to be seen – the next big bike lane meeting is set for this Thursday, May 8, 2014 at 6 p.m. at Nightingale Middle School. Be there! Read on for election results. It can be tough to put everything together to mobilize a get-out-the-vote initiative. This is not because it is a complicated process. It simply takes time and resources to gather a slate of candidates, let as many people as possible know who they are, and lead voters to elections to vote for these people. Without much time, and with zero resources, the people volunteering in Figueroa For All and with the LACBC’s RideFigueroa initiative came up with a list of bike-friendly candidates in NELA’s Neighborhood Council elections, we also created a spreadsheet of as many candidates running for office as possible, and emailed out a survey to candidates asking them if they supported bike lanes. The results of our survey of candidates was published on this shop’s blog. The Flying Pigeon LA shop hosted a bike ride the day of the elections to ensure that at least a few people voted for our pro-bike slate of candidates. Our numbers on the ride were low – less than 10 riders voted with our group at all the elections we attended (some joined us to vote in only one election, some voted in all three we visited). There was some drama about how we would ensure our voters had documentation to prove their “stakeholder” status the day before the election (documentation conditions more stringent than current voter registration requirements to vote for a congressman or president) – we know for a fact that some of our voters were turned away at the Greater Cypress Park Neighborhood Council. Fortunately, the people working elections with the Department of Neighborhood Empowerment were able to explain what we needed to show that our voters were stakeholders. An email the Monday after the elections made sure our votes counted. Whew! Thanks EmpowerLA! The results of all the typing and communicating in the stolen hours between work and home life? Figueroa For All endorsed Neighborhood Council candidates won 85% of the seats they were running for! The GCPNC is made up of 15 board members and a 4-person executive committee, with a pretty big chunk of board positions vacant prior to this election. 4 out of 19 is definitely better than 0 out of 19. The ASNC is a board made up of 21-person board with a 5-person executive committee. 5 votes is not a majority, but it’s a start! 19-person board with 5 executive committee members. Our voter guide picked a lot of winners in this election! The pro-bike lane council members have a strong majority in the HHPNC! 15 board seats w. up to 10 alternates and a 5-person executive committee. The Figueroa For All group didn’t do very much in this area of NELA and that is something that needs to be remedied. Congrats to Molly Taylor! 19-person board with a 5-person executive committee. 6 solid pro-bike lane votes plus many on the ERNC have expressed pro-traffic calming sentiment. That makes this a very bike and pedestrian friendly council. Mobilizing bike lane supporters for the upcoming May 8, 2014 “community meeting” (another entertaining fiasco in the making) being held by Councilman Gil Cedillo at Nightingale Middle School at 6 p.m. The majority of the North Figueroa Street bike lane project runs through Council District 1, overseen by Gil Cedillo. Whether or not Councilman Cedillo is swayed by any of this remains in the air. All of the work behind Figueroa For All, and much of what the LACBC’s RideFigueroa has done as well, has been to convince him that bike lanes, crosswalks, curb ramps, pedestrianizing several intersections, and coordination with local schools is worthy of his approval. It is unknown whether Councilman Cedillo will stamp out protected bike lanes on North Figueroa Street. His listed “alternative” for the project is worse than doing nothing, and shows a desire to make the project worse for bike riders and pedestrians alike instead of adding positive things to it. His district staff often wince whenever we bring up this issue with them – there is clearly something larger happening in his office with this issue, beyond his self-stated desire to “hear from the community”. These large meetings turn into vitriolic echo chambers for bike lane opponents, their small numbers of shrill complaints holding more emotional sway than the typically polite and well-researched remarks made by kids, parents, seniors, business owners, commuters, students and the like in favor of bike lanes. A small taste of victory with these “Bike the Vote” results, but will it matter? That remains to be seen. Keep your eyes on the prize, folks, and I hope to see you at the next public meeting on the matter on Thursday, May 8, 2014 at Nightingale Middle School at 6 p.m.